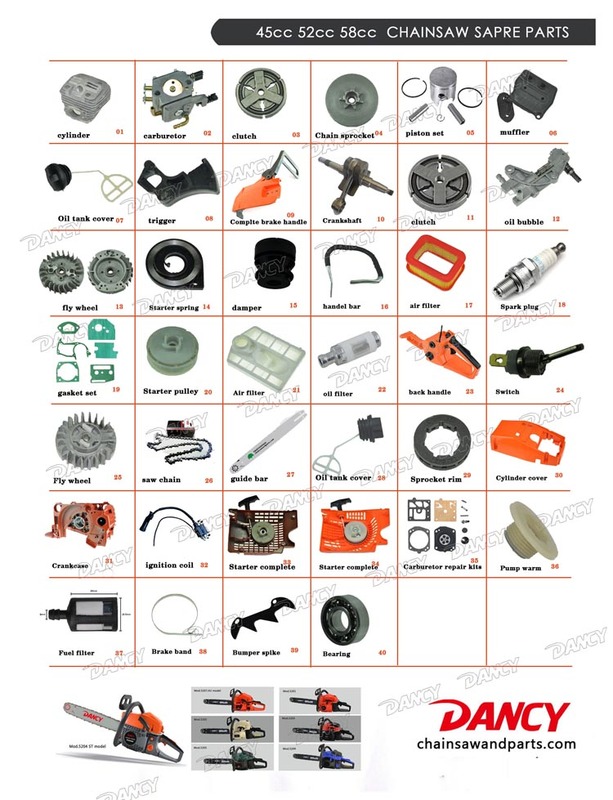 Product categories of 5200 5800 chainsaw parts, we are specialized manufacturers from China, 45cc chainsaw parts, 52cc chainsaw spare parts suppliers/factory, wholesale high-quality products of 58cc chainsaw spare parts R & D and manufacturing, we have the perfect after-sales service and technical support. Look forward to your cooperation! We supply a full range of spare parts for gasoline 4500 chainsaws,5200 chainsaws,5800 chainsaws. Parts include of crankcase,crankshaft,cylinder,piston set,carburetor,fly wheel,ignition coil,spark plug,clutch,chain sprocket,oil pump,oil pump worm,muffler,starter complete,starter spring,starter pulley,flywheel cover,break handle,brake complete,brake band,air filter,on/off switch,air door switch,oil tank cap,fuel tank cap,fuel filter,il filter,intake valve,chain adjuster,handle,rear handle,oil seal,gasket set,air purge,bearing,needle bearing,carburetor repair set,bar cover,guide bar,saw chain.